Does it bother anyone else that the name of the person who sent me the email pictured below consists of two words for things that can happen to improperly cared for clothes? 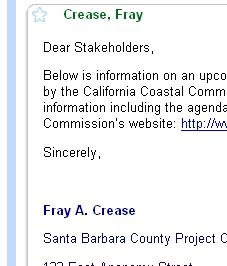 She or he has emailed me previously, which leads me to believe that "Fray" isn't a typo for "Fay." "Fay Crease," however, would only be marginally better.